Editor’s note: This is the final piece of a four-part series called ‘Part of the Team: The Impact of Female Coaches in the U.S.’ In Part I, two-time Olympian and former U.S. Ski Team member Nancy Fiddler introduced herself, Part II took a look at several influential female collegiate coaches, and Part III explored female coaching at the junior level. Part IV discusses women who work with the little guys, the future of skiing, through youth programs across the country. For many years, the height of my winter weeks came on Friday afternoons at 3:00. The snowy parking lot of the Tamarack Cross Country Ski Center in Mammoth Lakes, Calif., would fill with cars full of kids with an end-of-school-week itch. Soon, the ski center was full of snowsuit-clad youngsters jostling for space on the pine benches. The ski center prepares for the Gliders’ arrival ahead of time, lining up rental boots on the counter in a row from smallest to biggest. Skis and poles are fanned out across the snow out front, and the coaches are dressed and ready for action. Dashing between the tasks of helping the youngest tie, zip, and Velcro their boots and fitting tiny hands into pole straps, while also greeting and chatting with parents, I was typically in a full sweat by the time the Gliders lined up behind their team nation flags at 3:15. Fifty skiers between the ages of 6 and 10 are divided into Norwegians, Swedes, Americans, Russians, and Italians. The coaches stand at the head of the team lines. My favorite way to begin sessions was by calling first for quiet, and then for the Gliders’ Stomp. The sound of a hundred skis stomping on the packed snow begins in a disharmonious din, but grows into a unified beat of left, right, left, right, louder and louder. With the energy channeled, the coaches siphon off their groups, race through the teaching lanes and into the afternoon’s planned activities. Shouts, squeals, and laughter ring through the Lower Lakes Basin for the next hour and a quarter, as the kids skate through games of Sharks and Minnows, hunt for treasures, do relay races, or take off on adventures through the snowy forest. With plentiful snowfall in the Eastern Sierra, a favorite Glider activity is Powder Pigging. The goal of Powder Pigging is simple; climb a large hill either by means of a groomed trail or by breaking trail and then, simply, ski down through the un-groomed snow. The coaches themselves are big fans of Powder Pigging, because, after all, they are just overgrown kids who like to ski the trees. Powder Pigging is the hidden teacher of all skiing skills: balance, stance, weight shift, turning, and getting up after the occasional crash. Above all, Powder Pigging is the big motivator to ski repeatedly up the hill in pursuit of that perfect downhill run. Heading back to the ski center for the awaiting hot chocolate and Oreo snack after an exhilarating game or adventure, tired and happy, we smile those silly grins that almost hurt your face. Skiing with the youngest kids feels like the most important coaching I have ever done. When I retired from ski racing in 1993, I made it a goal to bring cross-country skiing to the kids of the Eastern Sierra. I began with high school and middle school teams, but didn’t get around to forming the Gliders program until my daughter, Laurel, was 5 and in need of an organized ski program. I had gone about the process in the wrong order, I realized. The youngest kids form the base of the skiing pyramid! They are the future of our sport; the life-long participants, the racers, the coaches, the officials, the instructors, and the parents of the next generation of cross-country skiers. Part IV of my series on the role of female coaches in U.S. skiing focuses on women who work with the youngest participants of the many cross-country ski programs around the country. I connected through email with six female youth coaches from Maine, Idaho, and California to find out more about their jobs, their programs, and their love of cross-country skiing. Grassroots ski programs take the form of Bill Koch Youth Ski League, local ski clubs, Ski P.E., and middle-school teams. The coaches who help foster these programs are working close to home with a large base of participants. Youth nordic ski coaches are often providing a child’s first outdoor winter experience. They are getting kids off couches and onto skis from New England to California. “Our team is open to any kid who can find boots. We have no tryouts and supply two pairs of skis, two sets of poles and a uniform. We are trying to expose as many kids as we can to cross-country skiing in a community with a very strong alpine skiing leaning.” — Mary Ellen Benier, head nordic coach at Alder Creek Middle School, Truckee, Calif.
With big ski mountains offering thousands of feet of terrain and plentiful snowfall, places like Truckee and Mammoth Lakes have a lot to offer downhillers. Kids growing up in these communities have plenty of opportunities to ski and snowboard the steep and deep, and play in the half pipes and terrain parks of giant ski areas. Attracting kids to cross-country skiing in these places can be challenging. Despite the lure of the alpine areas in the region, the Alder Creek Middle School (ACMS) team draws nearly 80 kids annually. The Tahoe-Truckee area is home to four major nordic areas with long operating seasons. The community of people who live in this area have embraced the active lifestyle, including nordic skiing. Benier and her co-coach, Mark Nadell, have worked hard to capture a large number of participants to the middle-school program. The ACMS team has become established in Truckee as a cool place to be, thanks to the efforts of Benier and the rest of the staff. It is affordable, the equipment has been taken care of, and it can compete with alpine and snowboarding teams with its reputation for being inclusive and fun. Kids want to be part of this energy. Nordic youth programs across the country are finding ways to attract the youngest skiers to the sport. Lauren Jacobs is the mid-Maine Healthy Hometowns coach for the Maine Winter Sports Center (MWSC). Jacobs’ job is to support active, outdoor lifestyles in the communities she serves. The MWSC offers year-round programming to help promote healthy living, and nordic skiing is a good solution to the long Maine winters. Jacobs cites initiatives like the MWSC and New England Nordic Ski Association (NENSA) ski-lease programs as being instrumental in getting families to introduce their kids to nordic. The MWSC has figured out a way to expose large numbers of the general youth population to cross-country skiing. Jacobs explained that the children who come from skiing families come to the sport fairly easily. The MWSC is literally bringing skiing to the places where kids actually are; school and after-school programs. Jacobs echoed Benier’s commentary on boosting participation. “My job is to make the introductory experiences as positive, fun, and accessible as possible,” Jacobs wrote. Abby Weissman is NENSA’s youth and introductory programs director. A Maine native, she’s responsible for putting on major events like the Bill Koch Festival, which draws 600 kids and their families. New England is home to over 40 active Bill Koch League (BKL) clubs. There are a lot of kids who are exposed to skiing in New England because of this activity. Weissman is going into her sixth year working for NENSA and has seen the organization’s youth membership grow 40 percent since she started. Weissman is clear that everything NENSA accomplishes would not be possible without tremendous community support. She sings praises of the many volunteers who consistently give back. “There are a lot of moving parts and my favorite part of my job is seeing how wide the community reaches and how much we can accomplish when we work together,” she wrote. The Skis for Kids lease program, which Weissman oversees, provides over 300 pairs of skis to New England kids. Accessible equipment, abundant Bill Koch League clubs, and volunteer support and activism are providing plenty of cross-country skiing opportunities to children in the northeastern US. So how does one become a nordic youth coach? With all the kids out there running around on cross-country skis, it would take an army of leaders to provide a safe environment where the fun and learning take place. The female coaches referenced in this story have a diverse set of skills and backgrounds, but share one important passion: a special relationship with skiing. James has been coaching the Devo Team at Sun Valley for two years. She has done some local racing and knocked the American Birkebeiner off her bucket list. A self-acclaimed newbie, James is fueled by her enthusiasm and respect for skiing. “Like any new discovery, I want others to be as excited as I am about skiing,” she wrote. Being involved with 7- to 11-year-old kids on snow has been an empowering experience for James. She sees skiing as a source of lifelong fun and friendships. “I hope that I can build confidence by helping kids realize that with dedication and focus they can accomplish things they thought were beyond them – a lesson they will carry throughout life,” she wrote. It does take a village for someone like James to find a footing as a nordic ski coach. She credits the support of the SVSEF coaching staff, which she describes as outstanding examples of skiers, coaches and people. James sees herself as a contributor to the big picture of U.S. skiing. She feels she is at the foundation of the sport, helping establish future generations of skiers who will take it forward. At Tamarack Cross Country, Jane Lester has been teaching and coaching for 14 years. Like James, she was a latecomer, drawn to the sport because of its camaraderie. An occasional citizen racer, Lester loves the peaceful quality of skiing most of all. Lester heads up the Tamarack Gliders program for 5 to 11 year olds. She has used a lifetime of teaching experience to become the coach she is today. She feels that her special skill is developing personal connections with each student. Marie French has been coaching the Tamarack Gliders for five years – not much longer than she’s been skiing. Regardless, French is an avid participant in all the local races and attended the Masters World Cup in Italy last winter. “I like racing and training myself,” she explained. “It felt very natural to work with kids who have fun and passion for cross-country skiing”. French hopes to continue to improve as a skier and racer so that she can bring more knowledge back to the kids she works with. She is channeling her excitement about nordic skiing directly into the children and knows she is making a difference when the Gliders move up to the middle school team and then the high school team. Benier has been leading the ACMS team for eight years. She plunged into coaching when her son, Stefan, joined the team in sixth grade. “His draw to join the team was primarily social and resulted in nordic kids becoming his core group of friends through college,” she wrote. A skate-skiing enthusiast for 15 years before she took up coaching middle schoolers, Benier considers herself a proficient skier, but without any formal training or racing experience outside of the occasional Great Race. Benier’s son moved beyond middle school a long time ago, but Benier has continues to coach the team. “It is a benefit to our society to turn any kid onto exercise and a sport you can do for a lifetime,” she wrote. Lester and Benier share the desire to function as female role models for the girls. They’re concerned lots of girls drop out of sports in middle and high school, but Benier believes she is making a difference. “I can’t match the racing backgrounds of some male co-coaches, but I can offer the perspective of cross-country skiing as a lifestyle and what you can get out of it,” she wrote. Jacobs picked up nordic as a senior in high school at Gould Academy in Bethel, Maine. She skied her way onto the Bates team, where she competed for four years. From there, she skied for the Skibec Club in Quebec City, followed by two years with the Craftsbury Green Racing Project (CGRP). Coaching gymnastics was a stepping-stone to coaching high-school skiing in Farmington, Maine, after college. Jacobs got into coaching the local BKL program while training with Craftsbury , and it was not long after that she started working at MWSC. For Jacobs, her own experience serves as her platform for coaching. “As someone who didn’t start skiing until my senior year of high school, it’s nice to be able to tell kids that they don’t have to have grown up with skis on their feet to still love the sport and go far with it,” she explained. She points out that aspiring female nordic coaches in New England are fortunate in that they have an amazing group of mentors to look up to in elite and collegiate coaches Cami Thompson-Graves, Becky Woods, Tracey Cote and Pepa Miloucheva. 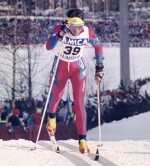 Weissman wrote that she fell “completely and wildly in love with cross-country skiing” when she moved to Carrabassett Valley, Maine, in 2004. A competitive runner in high school and college, her exposure to skiing was limited to family outings while growing up in Maine. Working in the Sugarloaf Outdoor Center and then as an English teacher at Carrabassett Valley Academy, she spent many hours nordic skiing in the woods nearby. Besides working for NENSA, Weissman puts on Fast and Female events in New England. She’s inspired by the current U.S. women’s national team, which, she wrote is a “phenomenal example of teamwork and healthy competition.” She couldn’t ask for better role models for kids in the East. The departing shot of this story – and series – is of the kids (and adults) who benefit from the creative energy of the female leaders of their programs. The many clubs, leagues, programs and teams around the country are alive and well. Youth development is producing outdoor enthusiasts, healthy kids, ski racers, and lifetime nordic skiers. At least for kids, the secret is in the play. Lester is a firm believer in teaching skills through fun activities. Jacobs is a fan of ski games because “they get kids moving, increase balance and speed, and- more importantly-help establish a really positive, fun atmosphere among a group,” she wrote. adding that she uses scavenger hunts to encourage kids to ski longer distances. Weissman’s nickname is “NENSA Fox” for the fox costume she wears at events. In keeping with this theme, she writes a weekly newsletter called “Fox Tales.” Working tirelessly to organize Bill Koch League events and competitions, Weissman stays on track with how youth participation fits into the big picture of skiing in the U.S.
Part of The Team: The Impact of Female Coaches in the U.S.